Intent: An ORC variant of Cyrus Tregessar's classic for ORC use and to honor this old boat. Material: Durasteel Hull, Upgraded Alusteel and Quadanium Double-Layer Composite Armor Plating, Glassteel and Transparisteel where appropriate. Description: More commonly known as the 'Sith Assault Frigate' the Boneshatter-class exemplifies everything that is dangerous about the One Sith. Appearing as a standard patrol frigate, the ship is designed to rush in and punch right through enemy convoys. It is especially well-suited to destroying other frigates and similarly-sized vessels. That is till the ORC got a hold of it. As major space battles were not common we needed a boat that could handle it self in the wilds of the outer rim. Built for down and dirty combat the "Boneshatter" was a perfect from to modify into a brute of a system patrol frigate. Similar to much of the One Sith Navy, the Boneshatter-class was built from the ground up to confront the Republic Navy and pick apart its vulnerabilities. However where the Dark Blade and Vanguard focus on long-range firepower and durability, the Boneshatter is built like a brawler. Most of the firepower is centered around the nose, and lessons from the past were applied to develop its main gun. The enemies of the outer rim are many and powerful, this brawler mentality was critical for the purpose needed from it. The nose contains three 'fast-rack' Assault Concussion Missile Launchers. Basically a standard launcher, the loading bay has the capability to load and fire two missiles in rapid succession from each tube, giving the ship an effective volley of six rather than three. This is rounded out by a pair of long-range turbolasers mounted next to the missile tubes, four heavy turrets, and an array of ion cannons and light turbolasers. In a fight, the frigate darts in close, firing with its turbolasers to weaken the enemy shields, then it launches a volley of the powerful ACM's at close range, potentially doing incredible damage to enemy ships. Like most things in ORC we like to take things to the max, so we increased its' close in abilities at the cost of its' longer ranged weapons. We removed the long range and heavy turbolasers off of the "Boneshatter" and replaces them with the unique weapon systems to the outer rim. In engagements the ship moves into close range and the Raptor ACES shield-cutters are used to strip the the enemy shields. Once down it will launch a powerfulACM volley are close range and follow up with the Primbec beam emplacements to shred the enemy. Against enemy capital ships, the frigate depends more on its speed and small size to evade concentrated weapon fire. While a durable ship, it is not designed to sit in a battle line and trade shots, it is built for breaking enemy lines and hit-and-run attacks. On top of that, the AA suite is somewhat lacking. This is partially compensated for by the fast-mount turbolasers, but overall the ship is somewhat weak when attacked off-axis by smaller an more maneuverable ships or strikecraft. To correct some of the small craft defense issues additional Rotary Ion Cannons were added to make it a better and balanced frigate.It still is not equipped to handle large numbers of fighter sized ships but is better balanced against them. 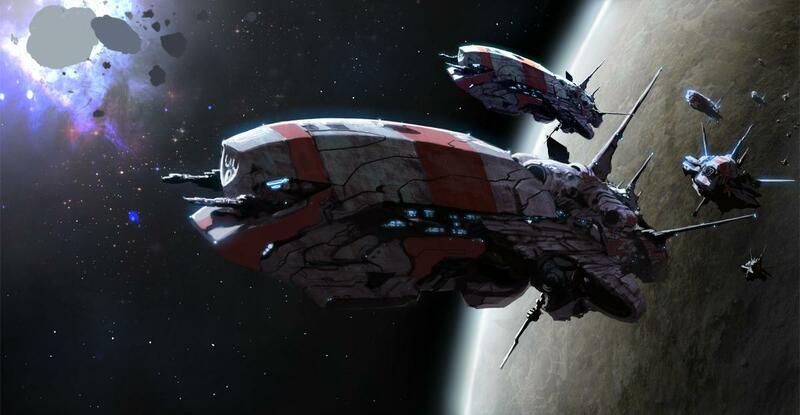 The aforementioned limitations were hardly enough to scare off the Sith from approving the vessel for mass production, and the 'Sith Assault Frigate' quickly became feared as a convoy raider and harassing vessel across Republic space. With the collapse of the One Sith the once ubiquitous Boneshatter-class Frigate found itself acquired by many different parties, including the First Order. While the Imperials would go on to update and modernize the ship, it found a home among dozens of pirate, corporate, and minor system factions. Given the sheer number of these ships in service, it was not a surprise when the design schematics themselves were uncovered and sold across the galaxy. Note, this is a report taken from the First Order and it looks like they counted the ORC as either a pirate, and minor system faction. To be honest that is the way we like it, we hope to continue to be underestimated and under the "radar" so to speak. The really only other option not noted here is the new hyperdrive system we added. While older, nothing beats the silkworm for reliability and speed. As the outer rim is so large with few established hyperspace routes increasing the transit speed of this vessel was a must. OOC: I have spoken with Cyrus Tregessar and he has approved for the ORC to use some of his subs, this being one. Edited by Bryce Bantam, 14 April 2019 - 08:49 PM.